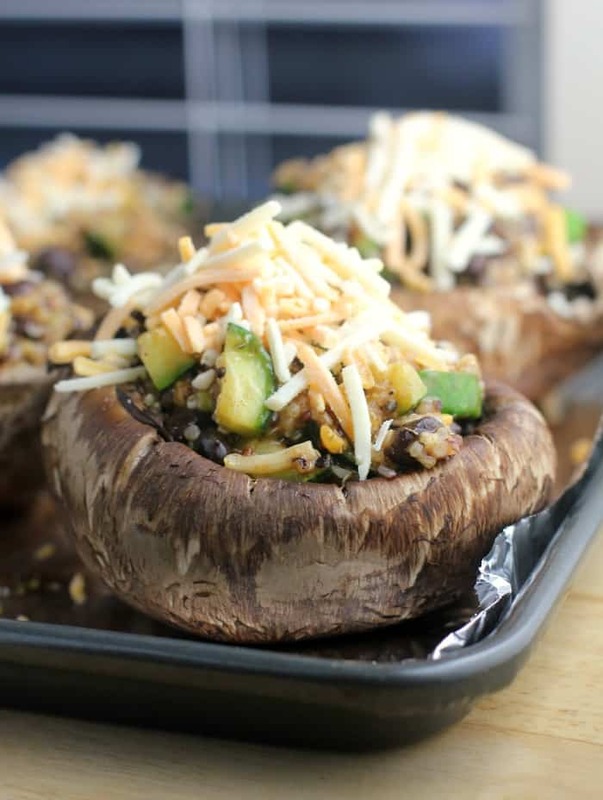 Beautifully gigantic portobello mushrooms stuffed with a nutrition-packed, gluten-free, diabetic-friendly, diet-happy-happy filling that will actually leave you feeling healthy and completely satisfied. 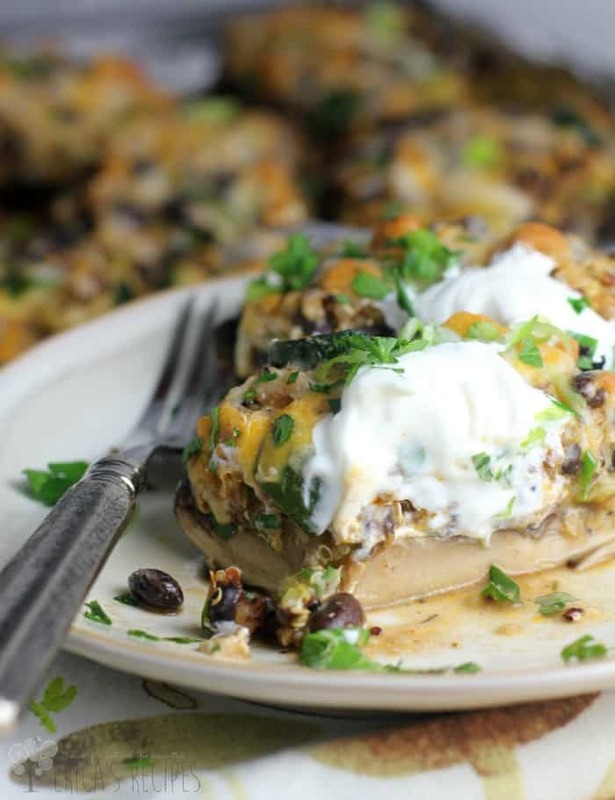 Topped off with a dollop of cool and hip Greek yogurt, this Mexican Quinoa Stuffed Portobello Mushrooms dinner will take that Mexican craving away, in a way you can feel totally good about. Gads what is that?! That’s been my email notification this whole time?! I am so sorry! Holy uninteresting dumbass ineffective notification …And what the hell is that Aztec-quilt-looking square thing …ugg. I cried. I would not click to read that crap ..and yet you guys have. Post after post. For going on two years. So thank you. With all my heart. …And as you know, cuz you got the new email today, I have hopefully rectified this oversight. 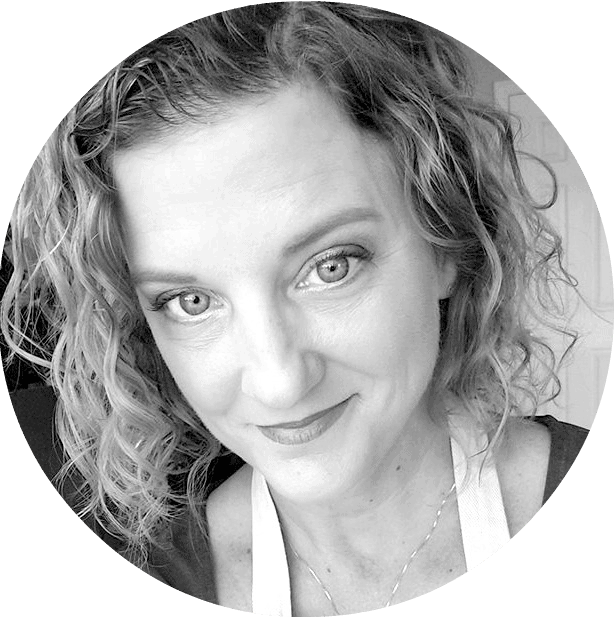 Speaking of subscribers, I had a particular person in mind when I made this recipe. …I was at church a couple weeks ago and went up to say hello to one of our deacons, one I had not seen in a while. And in talking with him and his wife, he told me he was a subscriber. Holy (no pun) floored! This made me ridiculously happy. He mentioned he would like to see more recipes for diabetics, so Deacon Jim, here you go. 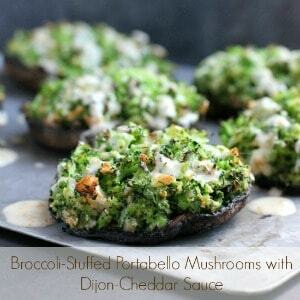 These stuffed mushrooms are amazing tasting, and they are smart. With all the elements you look for in a Mexican dish – creamy, flavorful, chili-cumin-spice – they are soooo delicious. With just enough cheese to check the box. …But they are also smart because of the quinoa. See, a lot of vegetarian recipes have beans and rice this, and beans and rice that, and I just don’t find them filling. By including quinoa, which is loaded with protein, this is solved and you will be satiated. Hey! Before you scroll below and check out the biggest stuffed shroom you ever saw (seriously, that pic is below) …if the idea of a giant stuffed mushroom for dinner is sounding gooood to you, also check out my Broccoli-Stuffed Portobello Mushrooms with Dijon-Cheddar Sauce. 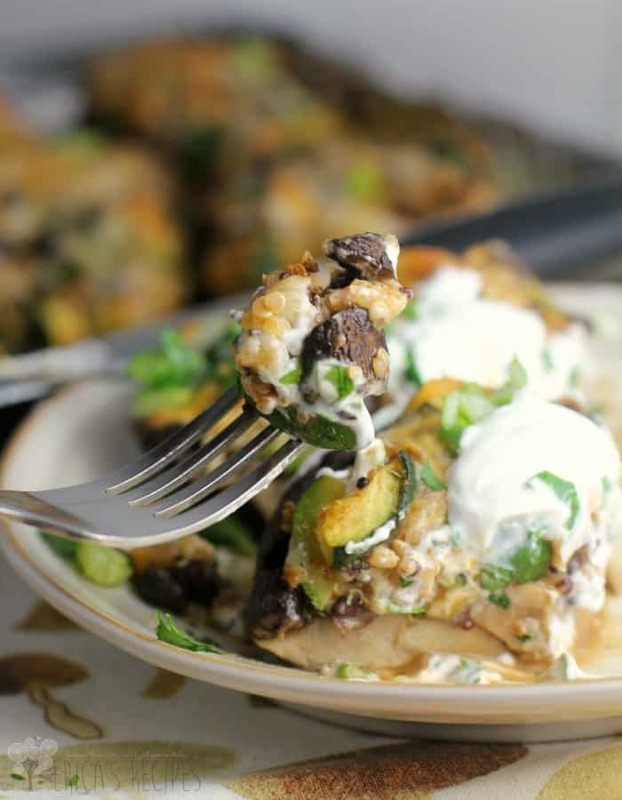 These are another outstanding vegetarian, healthy, gluten-free, hubba-hubba recipe. Basically, I made these up to check off a mac ‘n cheese craving that I had real bad but I still wanted something healthy. I was so thrilled these worked. They even reheat really well. Delicious! Ever since I made them, I have been hooked on stuffing portobellos. So the quinoa stuffing …this is easy. So easy. 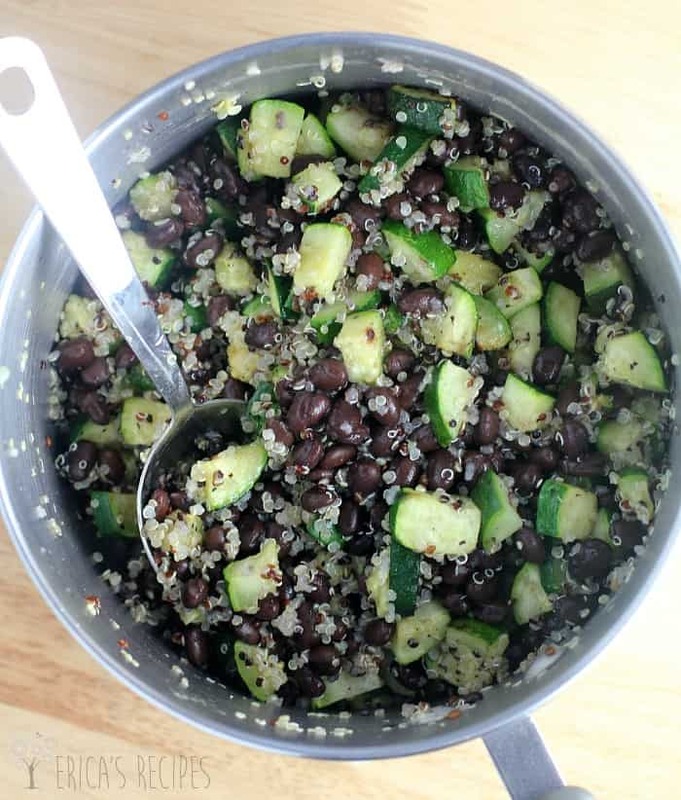 Just a couple ingredients: zucchini, black beans, a little onion, some seasoning, cheese, and quinoa, and there you have it. Oh, and Enchilada Sauce which you can make at home or purchase. ..Sometimes you need one less thing, I get it. I have actually made variations on this recipe like, ohhhh, a half dozen times now. But always as a stuffed bell pepper, and I just could not get that to work. The stuffing always ended up swimming in too much liquid. Finally, I decided to put the same stuffing in big beautiful portobellos and boom… Success. 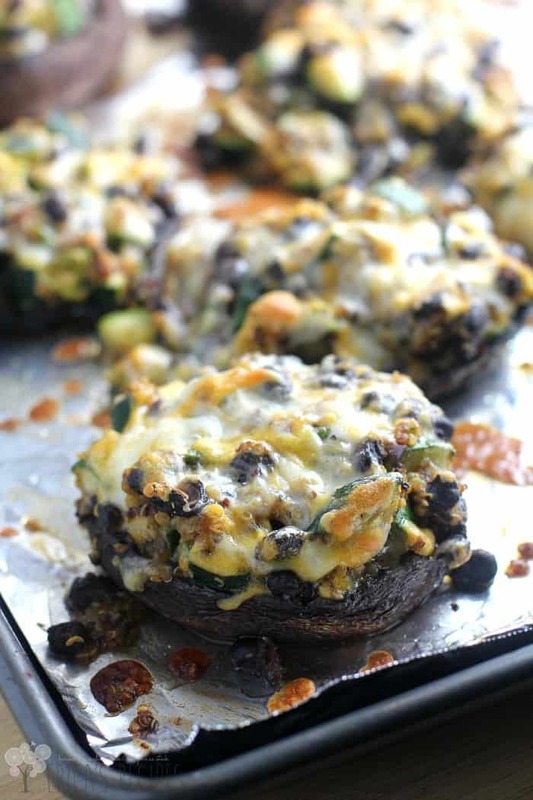 For nutrition, these stuffed mushrooms are perfect! Under 240 calories per mushroom (most of which are from high-fiber, low-glycemic index carbs) with a quarter or more recommended daily dose each of calcium, potassium, fiber, and protein. So, eat one with a side salad and some fruit for a healthy lunch (and yes, they do reheat well) or eat 2 with a bigger salad or some roasted broccoli or something for dinner. – I did both. We had dinner, then I had lunch with the leftovers. Yum yum yum yum yum. So there they are – these mushrooms satisfied us all. Even hubs, the inflexible carnivore. He words: “hmmm”. That’s major folks. That’s like 5 stars. If you are looking for a healthy vegetarian dinner that will fill them all up, this is that dish. Gigantic portobello mushrooms stuffed with nutrition-packed, gluten-free, diabetic-friendly, diet-happy-happy filling that will leave you feeling completely satisfied. Heat oven to 400F. Bring a medium pot of water to a boil. 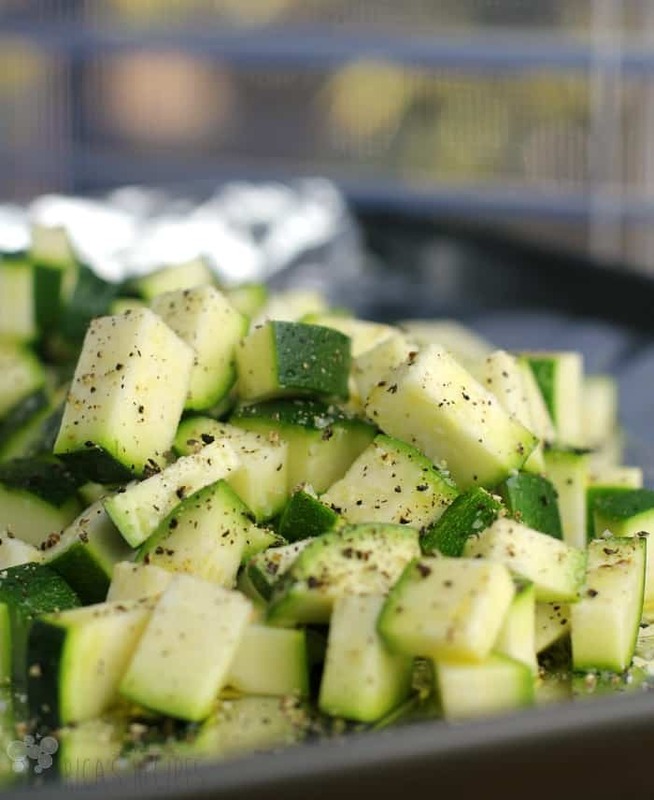 Put the zucchini on a rimmed bake sheet. Toss with a couple teaspoons olive oil and season well with a couple pinches each salt and pepper. Bake at 400F for 15 minutes until squash is cooked and very lightly browned around the edges. At the same time the squash goes in the oven, add the quinoa to the boiling water. Boil 15 minutes. Drain. While squash is cooking, also prepare the mushrooms. Remove the stems and use a spoon to gently scrape off the gills. Set on a bake sheet. Brush both sides with olive oil. In a bowl, combine the cooked squash, quinoa, black beans, green onion, smoked paprika, cumin, oregano, 1/2 t salt, good pinch pepper, enchilada sauce, and 1/2 c cheese. Spoon into the prepared mushroom caps. Sprinkle the remaining 1/2 to 1 cup cheese over top of each. Bake at 400F for 20-25 minutes until mushrooms are cooked and the stuffing is heated through. Serve topped with a dollop of Greek yogurt, garnished with green onion and parsley sprinkled over. Yields 4 servings. Wow! 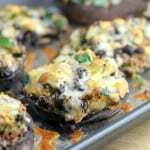 Erica, this is a beautifully gigantic portobello mushroom and then having it stuffed with a nutrition-packed, gluten-free, diabetic-friendly recipe is so very cool – your recipe is a savory saver – thank you so much – it looks fabulous! These are one of my favorites! yours look gorgeous! I love how healthy they are! Everyone can eat these! Thanks for sharing! That looks so good and healthy.. Love that you used quinoa. I love quinoa and I love the bite that mushrooms give. What a lovely dish, I need to try this. Thank you thank you thank you and thank Deacon Jim for me too!! It is really hard looking at all the delicious recipes knowing as a diabetic you can not go near them–this one will make me very HAPPY!!!!! I would definitely eat these for a meal. I love having vegetarian options as I feel like we eat WAY too much meat at times. I’m not a mushroom fan, but looks amazing, my husband would beg me to make these if he saw them though. Quinoa was such a welcome addition to my diet recently. It’s one of my favorite things to cook with now. I can’t wait to try these stuffed mushrooms. They look so filling, and won’t keep me from staying on track. This sounds amazing! I love mushroom! 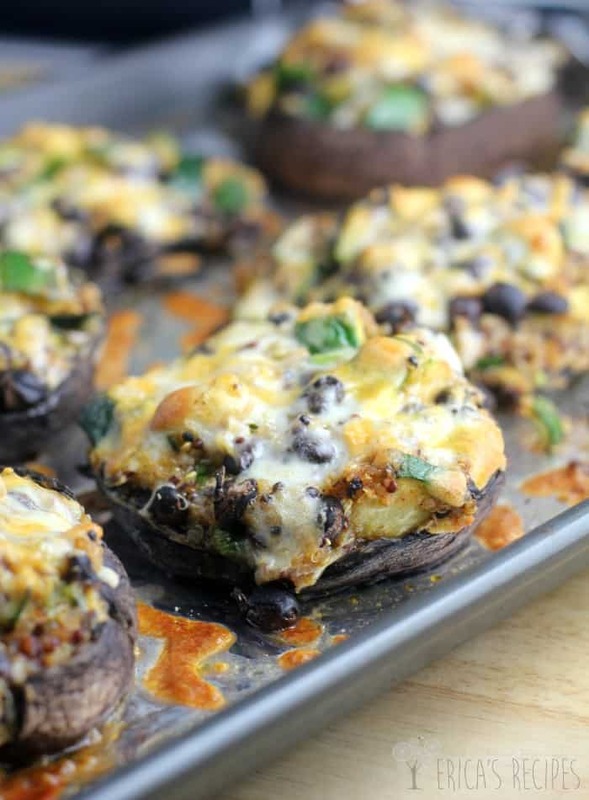 Love all the goodies you loaded these mushrooms with! Hearty and filling for sure! Looks wonderful in every way!! I’d love this for lunch or for dinner! OMG girl! These look insane! I just want you to come to my house and show me how to do this! Oh good gracious, that looks good! I am so excited to try this! Oh my goodness! I know I have to try these! Love mushroom anything! Oh my gosh that looks good! I make a different version often but this looks more filling/healthy. I love this recipe. I love Mexican and I love mushrooms. What a great idea. 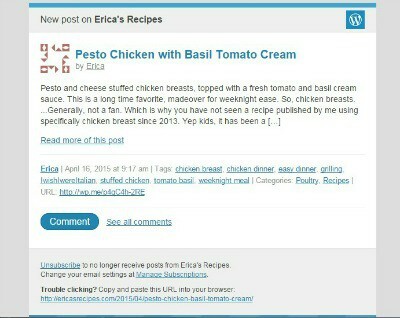 This looks really good Erica….even if it doesn’t have meat, lol. Seriously, I could devour these right up. Great job. Wow – what a delicious looking and sounding meal this is!! I am overly impressed.